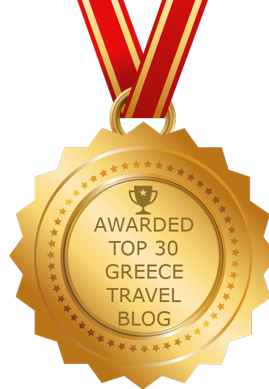 Last week I published a post profiling popular Greek Island swimming spots that don’t have sandy beaches. Here’s another one — the Giola lagoon on Thassos — which is arguably far more spectacular but also much more difficult to reach. 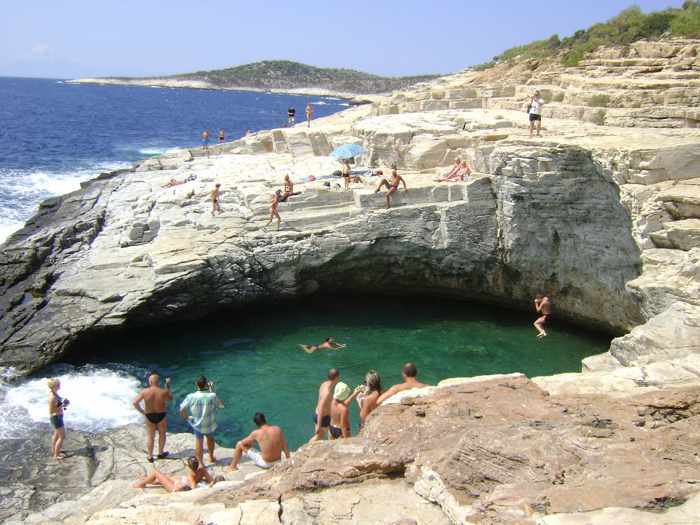 Carved into the southeast coast of Thassos, several kilometers from the village of Astris, Giola is a natural pool approximately 20 meters long and over 15 meters wide. 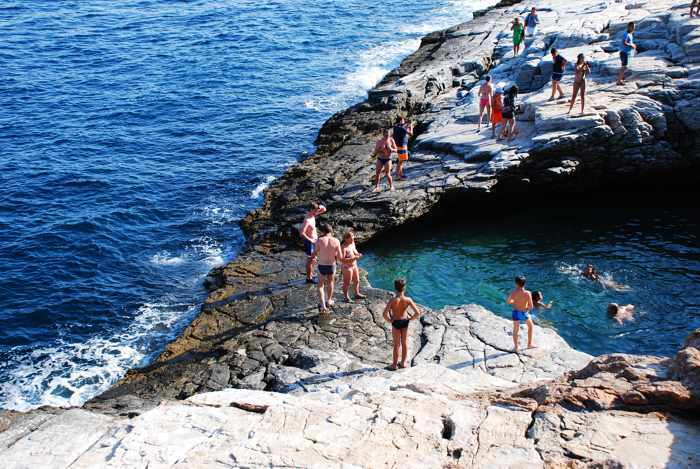 It’s enclosed by rock terraces that rise up to 8 meters high, creating convenient platforms from which visitors can jump and dive into the crystal-clear water, which is regularly refreshed by waves from the sea. Although it’s a visually stunning place to sunbathe and swim, Giola is a bit off the beaten path and not quite so easy to reach. But getting there is all part of the fun. You can find directions to the lagoon, complete with photos showing parts of the driving route and the hiking path to the coast, in FeelGreece.com’s Giola listing, as well as in the Let’s Find Giola post from the Discover Thassos travel website. Below is a Google Maps image showing the lagoon’s location, followed by photos offering views of Giola from several different perspectives. To see more excellent photos of Giola, click here to view a gallery of nine excellent Giola photos posted by Galeria Foto member moxxu. 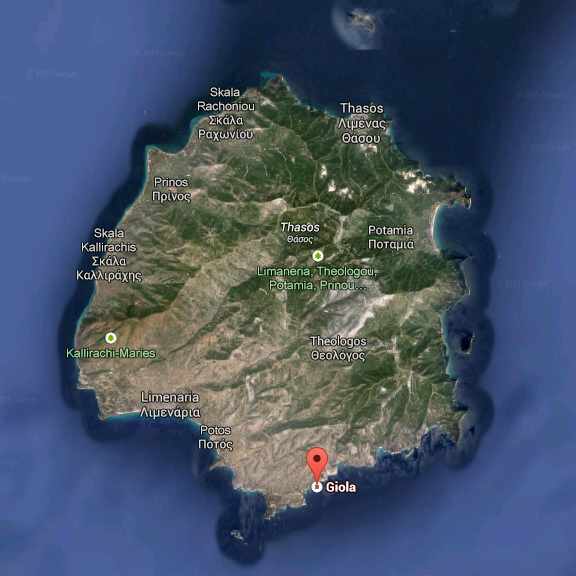 This Google image shows the Giola lagoon location on Thassos, an island in the Northeast Aegean Sea. 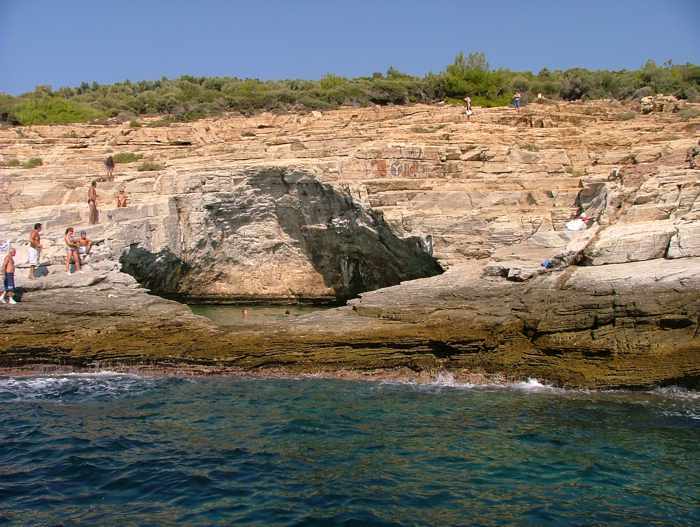 Giola is situated at a secluded seaside spot around 4 km from Astris village. You can drive most of the way, but then you’ll have to hike a trail to reach the coast. An aerial view of Giola lagoon. This image is from the website for the Potos Hotel located at Potos, about 16 km from the lagoon. You can see two more excellent photos of Giola on the hotel’s website. 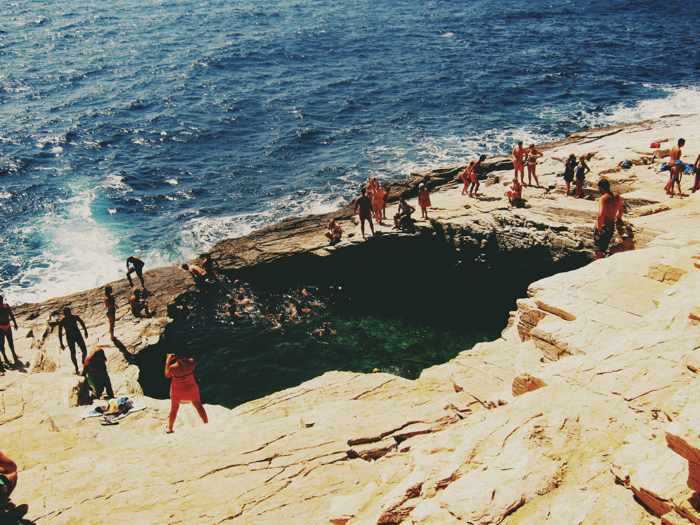 The A Beach A Day web guide for beach lovers published this photograph of swimmers enjoying the lagoon. Even though Giola is refreshed by waves from the sea, its waters apparently are much warmer than the sea. This unique seaview photo of the Giola lagoon is by Flickr member Ivonka. It shows the terraced flat rocks surrounding the pool on the seashore — perfect for sunbathing. 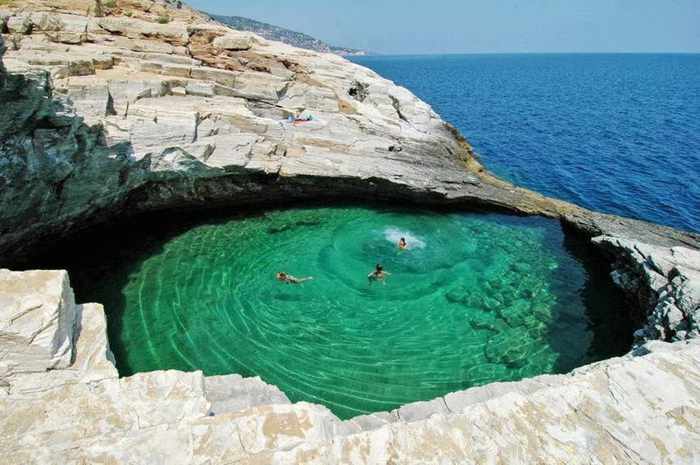 Greece has many beautiful swimming spots and if people were focused only on sandy beaches, they’d be missing out! 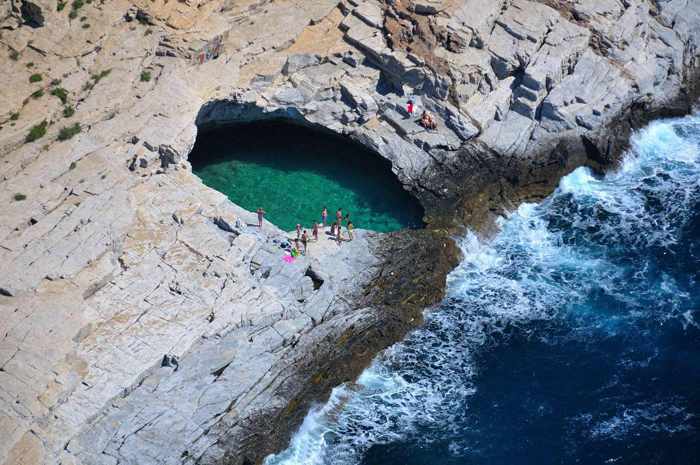 Thassos is a beautiful island that is a bit “off the beaten path”. This makes it an ideal location for people who want to kick back and relax on their vacation. The Giola Lagoon is one of the island’s most relaxing and beautiful spots!